The Go-Giver is a short, simple and powerful story about a man named Joe. Joe is looking for a last-minute, instant solution to help him meet his quarterly sales target. One of the more senior (and seasoned) sales people in the office puts Joe in touch with a person known as the “Chairman”. When Joe meets the Chairman, he is taken on a week long journey where he is taught the “Five Laws of Stratospheric Success.” These laws turn out to be universal truths that apply not only to sales, but to life in general. And these were just a sample of what I found when I browsed through my notes and highlights. There are many more poignant and insightful passages sprinkled throughout the book. 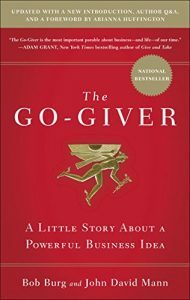 What I really liked about The Go-Giver is that its lessons are woven into an easy to digest story. It’s nice to be entertained while learning at the same time. The other bonus is that its direct, meaning that it’s not filled with a bunch of superfluous content. As you would expect, The Go-Giver is on my Must Read list. I can see why Larry Kendall recommended it so highly. Best of all, it doesn’t just apply to those in sales or business. It applies to everyone and anyone – entrepreneurs, business owners, leaders, sales people, or anyone who is just looking to get more out of life and be the best that they can be.